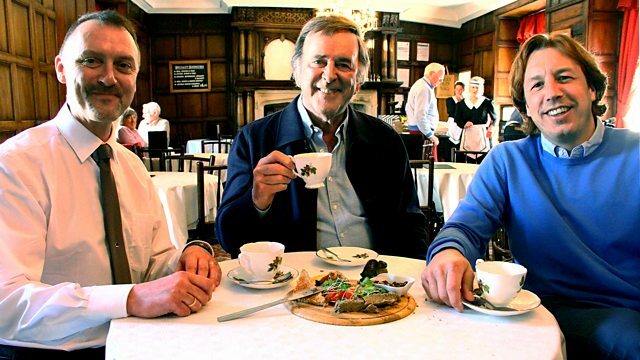 Terry Wogan and Mason McQueen are tucking in to some top-notch food from Dorchester visiting a garlic farm, a chocolate factory and a manor house. The London cab is navigating the winding country lanes of Dorset, where Sir Terry Wogan and Mason McQueen are trying some top-notch food from Dorchester. They find out about some of the famous names associated with the town and dine at the courtroom of hanging judge Judge Jeffreys, as well as tucking into pie and chips at Thomas Hardy's old architect's office. Their pursuit for the best local food takes them to a garlic farm, a chocolate factory and a manor house where the vicar supplies the local cider.